With the school year winding down, amusement parks throughout the country will soon be packed with kids and kids at heart. In this neck of the woods, HersheyPark had no peer for the longest time when it came to offering gluten-free foods, but now others are catching up. Dorney Park & Wildwater Kingdom in Allentown has added gluten-free pizza (at Patio Pizza, Coaster's and Typhoon Treats), fries from dedicated fryers (at Chickie's & Pete's, Coaster's and Just Chicken/Just Tacos), salads (at Coaster’s, Center Stage, Monster Grille, Patio Pizza, Game Day Grille, Clucks & Franks and Typhoon Treats), Dippin' Dots (all flavors except Cookies n’ Cream and Chocolate Chip Cookie Dough), soft frozen lemonade and cotton candy. The kitchens are also able to accommodate preparation requests such as hamburgers, hot dogs and chicken without rolls. At Knoebels in Elysburg, Pennsylvania - advertised as America's largest free admission park - there are several options. The Alamo Restaurant has proteins and salads (without croutons), while you can order hard-shell corn tacos, salads and nachos at the Mexican stand in the International Food Court. Breakfast items at the Food Court include eggs, bacon, sausage and hash browns. The new Merlin's Restaurant at Lancaster's Dutch Wonderland, opening early this summer, will have a gluten-free menu. 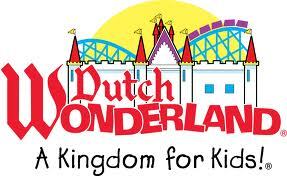 Ingredient lists for the park's restaurants will be posted at the Dutch Wonderland website. This season, Sesame Place in Langhorne offers Conte's bake-in-bag gluten-free pizza at Elmo's Eatery and Captain Ernie's Bistro. The park also has allergen-friendly snack packs from Rebecca & Devyn’s Gluten Free To Go at Elmo’s Eatery, the Snack Cart in front of the Dine with Me building and at the Popcorn Cart located behind Elmo’s Eatery. Camelbeach, another Poconos waterpark, has gluten-free pizza by request at the Cammello's Pizza concession. HersheyPark continues to offer many gluten-free choices for the 2012 season, including Famous Famiglia pizza (stands located in the Hollow, Midway and Rhineland areas and at Minetown Restaurant), rotisserie chicken (at the Central PA Kosher Mart), burgers with buns (at Craftbarn Kitchen, Whistle Stop Restaurant, Shore Line Grill, Decades and Minetown Restaurant), chicken tenders (at Shore Line Grill and Minetown Restaurant), chicken sandwiches and grilled chicken salads (at Decades and Shore Line Grill), tacos and nachos (at Tumbleweeds Taco), wraps (at Crustano's Deli) and sandwiches (at SooperDooper Sandwich Shop and Crustano's Deli). The staff is trained to handle allergen-friendly food options with care; when an order is placed for a specialty item, kitchen staff will wash their hands, put on new gloves, and use all new utensils designated specifically for our specialty items. If more information is needed, email Guest Services or call 717-534-3855. A bit further away is Kings Dominion in central Virginia, where guests can find personal-size cheese pizzas (at Tower Pizza, Victoria’s Pizza and Congo Grill & Pizza), nachos and cheese sauce (at Border Café), hot dogs (at Johnny’s Grove Grill), hamburgers (at Trail’s End Grill), french fries (at Border Café, Johnny’s Grove Grill and Trail’s End Grill), and salads with Honey French dressing, Dippin’ Dots, soft frozen lemonade and cotton candy throughout the park. Ask for a supervisor when ordering gluten-free nachos, hot dogs and burgers. Williamsburg, Virginia's Busch Gardens advises guests to speak with a supervisor at meal facilities to determine a meal that will be safe. The park offers several allergen-friendly prepackaged items for special dietary needs, including Conte's gluten-free pizza. For inquiries in advance, email Guest Services. Thanks for this great resource for kids to have fun! Thanks for the great info! Just told me more than the parks told me themselves!! !